Beards are in! If you find yourself having beard envy, hair transplantation surgery may be the answer! An increasing number of men are embracing facial hair and beards as it is a global craze and seen as a sign of masculinity. According to DNA Info website, recent reports say the Beard Transplantation Procedure has increased six-fold in the past five years. It takes time to grow a beard and it can be a challenge for some men to even grow stubble, the Beard Transplantation Procedure can be the solution. Before one starts their facial hair journey it is important to be informed on the process, below are 8 Frequently Asked Questions. FreeImages.com/diego medrano. Typical patients include men who have struggled since adolescence to grow a beard, men with facial scarring, those filling in a few gaps or the ones interested in doing a complete beard construction. No matter the situation the look men are going for is definitely to have a bit of facial hair. Like any scalp hair transplant, the procedure is practically painless. Most of the time, it is conducted using the FUE hair transplant technique. At The Paragon Plastic Surgery and Med Spa we are one of two in Texas that offer the ARTAS System. ARTAS is the first Hair Transplant Robot to improve the most challenging aspects of Follicular Unit Extraction (FUE). It offers numerous beneficial features, including an image-guided robotic arm, special imaging technologies, small dermal punches and a computer interface. The ARTAS System is capable of identifying and harvesting individual follicular units to implement the FUE technique. The hair for beard transplants typically is taken from the back of the patients head and then planted through micro-incisions on the facial region desired. The hair from the back of the head most closely resembles the hair grown around the chin. In cases of those with a balding head, your surgeon may extract donor hair from body hair. This transplant procedure takes about 2-7 hours to complete, depending on the area covered and the beard density you are looking for. Free images.com/Toni Mihailov. Once transplanted, the beard hair takes root gradually. The transplanted hairs fall out after two weeks but the roots stay and begin to grow new hair within several months. Put your faith in science. Once it’s fully healed, the new facial hair can be treated just like real hair because that’s just what it is – real hair. Do not shave the transplanted hair for the first couple weeks after the surgery. After this short phase, you can decide if you want more of a scuffy “just rolled out of bed look” or if you want to shave and have a silky smooth baby face. Free images.com/Paul Preacher. In most cases plan on having 2 to 3 days of social down time. So, pull out the video games, the Netflix binge schedule and last but not least the food and enjoy your down time while knowing soon enough you’ll have the facial hair you’ve always wanted. A very important feature and benefit of any type of hair transplant is that it gives permanent results. You won’t have to worry about losing your new facial hair or having to be careful with your new hair after you’re totally healed from the transplant. Once the hair takes root it really is your very own facial hair! Make it a fun experience! Patients are encouraged to bring in pictures of their favorite celebrities beard/facial hair that they are wanting to mirror. This gives the surgeon a great idea of what the patient envisions for himself. Call 817-473-2120 or Email [email protected] to schedule a consultation with us today! 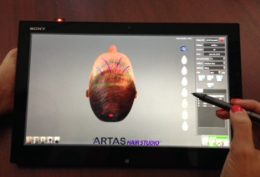 Recently, Restoration Robotics launched ARTAS Hair Studio. This state of the art product allows the patient and surgeon plan and produce a simulation of a possible outcome. Although this product has some limitations to the realistic look of the transplanted hair, it does allow for a formal interaction between the surgeon and the patient that spawns more thought into the over- all operative goal and leads to increased numbers of hairs being transplanted. The most common cause of dissatisfaction of hair transplant patients in my practice and in patients that come to me from other practices is that they didn’t get the thickness that they wanted. The ARTAS Hair Studio allows the patient to “Test Drive” their appearance and modify the operative plan under the guidance of the surgeon. It becomes the surgeon’s ethical and responsible role to provide guidance on safe and age appropriate hairline design, donor capacity, and realistic expectations on social and physiologic downtime. The ARTAS Hair Studio becomes paramount providing a sneak preview to esthetic results that vary with amount of hair. Put together with a well informed consult discussing preventative hairless measures backed by randomized double-blinded placebo controlled trials, the ARTAS Hair Studio is quickly becoming the standard of care in hair restoration planning and patient education. ARTAS Hair Studio also integrates directly with the robot and becomes the operative plan for the patient ensuring that the patient is receiving exactly what he is intending to recieve. For a consultation please call 817-473-2120 or email [email protected] Skype and other internet-based consultations are available. Mark A Bishara M.D., P.A. and Paragon Hair Clinics care for patients world-wide. Dr. Mak A Bishara, M.D. P.A. performs robotic follicular unit graft selection for residents living around Mansfield, Southlake, Dallas, Arlington, Fort Worth, and surrounding the DFW area in North Texas. How many hairs come out of a graft area? The number of hair ranges from one hair to four hair for each graft. We have an advantage by using a robot to select only two hair grafts if we need to provide more density. On the other hand single hair grafts are very important for the front of the hairline to get a feathered natural look. We also have the ability to program the robot to only take single hair follicular units. What % of hairs actually take? 90% of transplanted grafts or better will survive in the recipient site. Much of this is determined by the use of PRP, the use of high potassium based holding solutions, and decreasing the time to transplantation. Limiting our hair transplant sizes the 800 g per session Minimizes the time of out of body and oxidative stress on the follicle. What is the long term aftercare? After transplant you may begin to use minoxidil at one week or once the scabs fall out. In the immediate postoperative period, there is a shampoo, conditioner, spray, and copper impregnated guaze pads. These are very important for healing and specifically Helps decrease the downtime from the procedure. I highly recommend the graft site kit and it is available at our office. After the hair transplant several months later you will begin to see your new hair growing. PRP injections would be advisable in your case at 4 weeks and 8 weeks. We would look at your overall hair Results of 10 months and recommend additional transplants in that area if it looks beneficial. You can of course transplant another area after two months allowing the donor site to heal appropriately. There is no long-term of you care needed the transplanted hair. It is your hair and you don’t need to do anything to it to the transplants. Will I need prp with the transplant? This is answered above, PRP treatments will provide you with more hair mass. The recommendation is to do this might not only help your transplanted here but more importantly to prevent your natural hair from falling out. As discussed in our consult, there has been no large multi institutional randomized double-blind placebo-controlled trials that have been peer-reviewed to support a statistical significance of hair mass to date. Existing here should go from the flimsy hair to thicker more robust hair and will give Is the appearance of more hair in some individuals. Should I stop rogaine so you can really see the troubled area in its entirety before transplant? No, you should not stop rogaine use. Will I lose the transplanted hair over time since I am diagnosed with hereditary hair loss? Most likely yes but by using hair laser you will slow your hair loss down. Is it harder to transplant African American hair? Does it take to the new site as well? Does it take longer? Have you performed any transplants on African Americans? It is not technically harder to transplant African American hair. The success of hair restoration at the receipt site is acceptable. It does take a little bit longer and yes we have conducted African American hair transplants. AA have acceptable results usually require multiple procedures. What should I expect during procedure, and what should I expect at home after procedure? You can expect to come to our office early in the morning take before pictures, have blood drawn, sign consent forms, and be placed in the chair where the nerve block will be performed. You’ll be given antibiotics and a sedative by mouth, next PRP will be injected into the recipient bed followed by recipient site creation. You will then be placed into the robot where we will dissect out a number of grafts that correspond to the number of recipients sites that we created. Then we will place you back into the chair to implant you. You will rest for two days without increasing your blood pressure and we will follow up with you 2 weeks later on the phone call. Most of the scabs and existing hair connected to the follicle with fall out by seven days. You’ll have some existing scabs. Social downtime is about a week. We look forward to helping you through your hair restoration journey! Robotic follicular unit graft selection is important during hair restoration surgery because the surgeon can select 2 hair, 3 hair or 4 hair follicular unit grafts and avoid taking single hair grafts when they’re not needed. This supplies more total hair transplanted during the transplant procedure than a typical nonselective process will provide. The robot sees different hairs that are grouped together with two or more hairs. Using the optical guidance system with two separate cameras you can distinguish these from single hair grafts. Dr. Mark A. Bishara, M.D. P.A. programs the robot to only select out thick, more robust follicular units which provides the patient with more hair and a thicker result with minimal soft tissue wounding in the donor area. This advancement is by far the most significant benefit towards the economy of motion during the procedure. Please call 817-473-2120 or email us at [email protected] today! The latest advancement in robotic hair transplantation that has been successfully achieved and FDA cleared is recipient site creation for subsequent manual implantation of the harvested follicles. The process begins first by creating a model, site making is preplaned on a tablet computer. The plan is then exported to the computer terminal on the robot. Next, we create a hairline and can design a pattern or a direction of hair flow. The ARTAS Hair studio allows the physician to preoperatively plan for the distribution of the recipient sides in the most appropriate and artistic hairlines. Preoperative planning avoid mistakes of under filling important areas and over filling less important areas with grafts. Once the plan is loaded into the robot the patient is positioned as such, a fiducial system is loosely affixed to the patient’s scalp. The patient is mildly sedated and anesthetized with local anesthetic injections. Finally, the robot creates the preplanned recipient sites designed by the robotic hair transplant surgeon.